GM’s July sales report was released last Friday, demonstrating GM’s latest victory: the first automaker to exceed 1,000,000 sales of trucks and SUVs in the U.S. this year. GM also earned this distinction in 2013. Particularly, GM moved 1,048,114 trucks and SUVs by the end of July of this year. Mr. McNeil is right. In total, General Motors delivered 256,160 units, which marks the best July that the company has seen since back in 2007 and a 9 percent increase over July of 2013, with retails sales specifically up 4 percent, commercial sales up 69 percent, and other miscellaneous fleet sales up 21 percent. In total, GM sold 100,122 crossovers and SUVs in July, and 587,250 in all of 2014 so far. 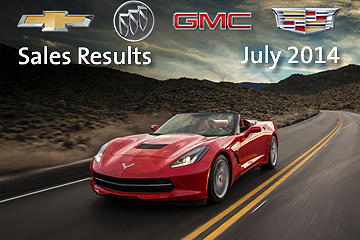 GM’s July sales are likely indicative of a continuing trend for the brand throughout the remainder of 2014, in terms of year-over-year sales figures.